Before greeting you each personally, I desire to tell you that I will continue to be near to you in prayer, especially in the upcoming days, so that you may be entirely docile to the action of the Holy Spirit in the election of a new Pope. May the Lord show you what He wants you to do. And among you, in the College of Cardinals, there is the future Pope, to whom I, already, promise my unconditioned reverence and obedience. For this, with affection and thanksgiving, I impart to you from my heart the Apostolic Blessing. Contrary to what everyone in the secular world apparently thinks, these are not the words of a man who is somehow going to influence the election of his successor from behind the scenes. This is it, and likely the last time anyone will see him in public until his funeral. From this lowly layman, mille grazie, Papa. You have been far more that a "simple and humble laborer in the vineyard of the Lord" and have shaped the lives of countless Catholics more than you will ever know. The Church will be eternally grateful for your life and your witness. It's high time I finished up with Sacrosanctum Concilium so I can move on to another one of the apostolic constitutions from Vatican II. Sacrosanctum Concilium has a lot more to say about the rites of the other sacraments, the Divine Office, etc. -- I wish I could devote posts to all of these issues, but like I said, I need to move on. So, this will be my last post on Sacrosanctum Concilium, and it will focus on the issue nearest and dearest to my heart: sacred music. The liturgical year is to be revised so that the traditional customs and discipline of the sacred seasons shall be preserved or restored to suit the conditions of modern times; their specific character is to be retained, so that they duly nourish the piety of the faithful who celebrate the mysteries of Christian redemption, and above all the paschal mystery. All that talk of preservation and retention sounds great. I don't see anything in here about wholesale changes to saints' feast days or the elimination of the pre-Lent season of Septuagesimatide, the Octave of Pentecost, or Ember Days. Yet another example of the liturgical "experts" running amok after the Council. My sacred music post is getting shorter and shorter as the time gets later and later. Nothing the Council Fathers state in the chapter on sacred music is particularly jarring or a break with the past -- sacred music should foster unity and solemnity during the liturgy (par. 112) and should be preserved and fostered with choirs and other schools (par. 114 and 115). Then come the most ignored words in the entire document: "The Church acknowledges Gregorian chant as specially suited to the Roman liturgy: therefore, other things being equal, it should be given pride of place in liturgical services." I really would like to get posters made of this sentence and mail them out to every music director at every Catholic church. I would venture that upwards of ninety percent of parishes in this country hear chant maybe once a year (if you count O Come, O Come Emmanuel as chant). A much higher percentage does not even know that there are other things out there than the "four-hymn sandwich" (consisting of entrance, offertory, communion, and dismissal). Why have we completely eschewed the Propers of the Mass, which, being Scripture, are vastly better suited to the Holy Mass than even the best hymns? Why do most parishes ignore the vast treasury of music from the 2,000 year history of the Church (the past 700-800 years of which yielded a great number of works that still survive)? Additionally, the tripe peddled by David Haas, Marty Haugen, Michael Joncas, etc. is emphatically not what is supposed to be used during Holy Mass. Sure, some of the songs may be catchy, but that is not the standard by which liturgical music is to be judged. Sacred music is to edify the mind and heart and add solemnity and reverence, not banality, to the sacred rites. I don't deny that some of these songs are uplifting and prayerful (once upon a time, I even enjoyed one or two of them), but listen to them during your own prayer time if this is the case. Sacrosanctum Concilium also states that the pipe organ is "to be held in high esteem," while making provision for the use of other instruments. These other instruments are permissible "only on condition that the instruments are suitable, or can be made suitable, for sacred use, accord with the dignity of the temple, and truly contribute to the edification of the faithful." Guitar? Negative. Percussion? Negative. Piano? Negative. None of these instruments are dignified or suitable for sacred use, though they are all capable of producing beautiful music. Fortunately, as the Church and her members become more authentically Catholic, I think that the state of sacred music in this country is on the road to recovery, thanks in large part to great groups like the Church Music Association of America and many fine bishops and priests. As a postscript to this set of posts, I discovered that the Council Fathers took up the question of whether it would be acceptable to fix the date of Easter on a certain Sunday of the year, thereby making the Sunday cycle unchanging from year to year. Their final opinion was that they "would not object" to making such a change. I am relatively indifferent on this topic, but in the end, I am glad that this did not come to fruition -- I believe it is more meaningful to have the date of Easter calculated the same way that it has been for almost 1,700 years. I will start on either Lumen Gentium or Gaudium et Spes next. Humor from Lutherans? Who knew that such a thing even existed? I'm also a failure because I missed Mass on Saturday and today. And I'm a failure because I'm eating a snack right now. But this is the beauty of Lenten penances/mortifications -- while we may feel guilty when we fall off the horse, it is a good opportunity to examine the reasons we undertook them to begin with and resolve to start fresh. We also take solace in the fact that our guilt should only be fleeting. So, take two. Here we go! P.S. In case you have forgotten, you should be praying for the pope extra hard for the next three days. Still no time for lengthy posts, so my long-anticipated post on sacred music will have to wait. Let us pray for Benedict, our Pope. What a wonderful gift it is for the teaching authority of the Church, symbolized by Peter's Chair, to have endured for so many centuries. After yesterday's whopper of a post, I decided it's time to take a bit of a breather. Plus, moving day is on Saturday, so we're frantically trying to get everything packed in time. Why the liturgy? Because Pope Benedict knows that “the Church stands [or] falls with the liturgy” and that “the true celebration of the Sacred Liturgy is the centre of any renewal of the Church whatever”. His profound concern is that the Church worships Almighty God correctly, and thereby be fully connected to the indispensible source which sustains and empowers Christian life, witness and mission. If the liturgy is impoverished or off-track our ability to live the Catholic faith and to evangelise suffers. These reforms have not been arbitrary impositions: he knows only too well the limitations of authority in respect of the Sacred Liturgy. Rather, they have been incisive, calm, even quiet corrections or exhortations – in words and by example. 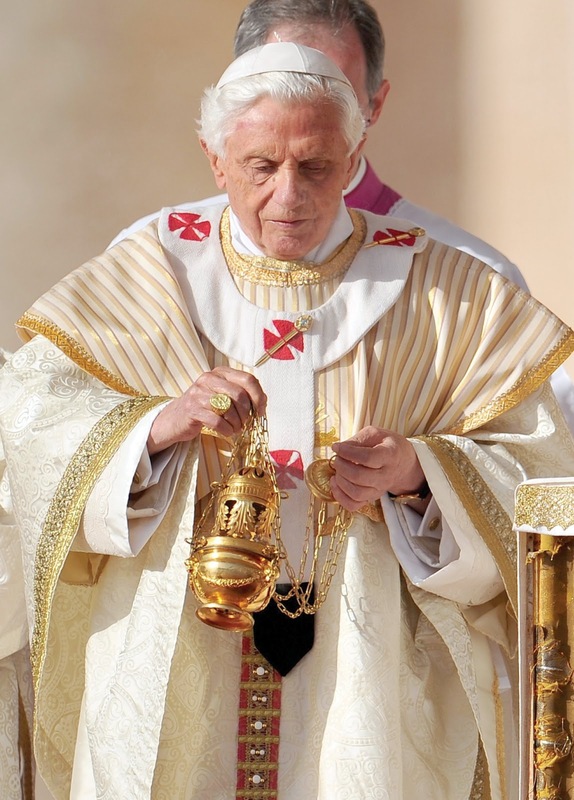 At the heart of his reform is Pope Benedict’s conviction that Catholic liturgy “is not about us, but about God”. This explains the crucifix at the centre of the altar. It is why he publically celebrated the modern Mass facing East in the Sistine and other papal chapels. There never was a need to put a table altar in front of the altar in the Sistine Chapel (or elsewhere), but it took a pope with liturgical vision quietly to remind us of this. Similarly, his manifest conviction that the normative, if not also most appropriate, manner of receiving Our Blessed Lord in Holy Communion is kneeling and on the tongue remains a challenging invitation to reform local practice. His words, acts and example since have indeed inspired a movement toward the right way of celebrating the liturgy, inwardly and outwardly. However much more we may have liked to see, he has quietly laid deep and solid foundations for a new liturgical movement upon which others can now build. This piece (and really, Benedict's whole pontificate) fits in nicely with my posts this week on liturgical matters in the context of what the Second Vatican Council said in Sacrosanctum Concilium. Our Holy Father rightly sees the sacred liturgy as essential to the life of the Church, which is why he has devoted so much time and energy to speaking and writing on these matters. He has led by example, not imposition -- much as I personally would have liked him to revoke the indult allowing Communion in the hand or mandate that Mass be celebrated ad orientem, I know he has taken the correct approach with his gentle and pastoral style. As with the all of the Church's doctrine, Pope Benedict has proposed, not imposed. I pray that our next Holy Father will continue this work of revitalizing Catholic worship so that with our minds focused on the things of heaven, we may more effectively show the world what it means to be followers of Christ. The sermon was on the gospel in the Extraordinary Form today (which bore a striking resemblance to the gospel in the Ordinary Form today, as Matthew's and Luke's accounts of Jesus' temptation in the desert are very similar). Father preached on the temptation of power offered to Jesus by the devil in this passage (pointing out that Venerable Fulton Sheen once remarked that the most frightening words in all of Holy Scripture are the devil saying that all the kingdoms and powers of the earth belong to him). While recognizing that many good and holy people go about their daily work in politics, entertainment, academia, etc., the fact remains that Satan is the prince of this world (and is identified as such by Jesus) and ultimately has a high degree of control over worldly institutions. From here, he began speaking directly to me, as priests often do when I need to hear something. He lambasted the tendency among faithful Catholics of a more traditionalist stripe to disengage from the world and become what he called the "Catholic Amish" by cutting off almost all contact with the world and preventing their children from ever engaging the culture around them. This is certainly a temptation I have on a very regular basis -- I really would love to move out to the middle of nowhere and not have to deal with any of the ways in which our world is going to hell in a handbasket. Father went on to say that Satan's greatest weapons are not evil persons or organizations -- his greatest weapon is indifference, which brings to mind one of my favorite sayings: "The only thing necessary for the triumph of evil is that good men do nothing." (It turns out that this cannot be verified as a quotation from any of Edmund Burke's writings. Interesting.) If those of us who strive to be faithful followers of Jesus tacitly accept the evil around us, what more does Satan need? But the faithful Catholic must choose neither withdrawal nor indifference. We must engage the world around us, as so many saints have done before us. Out great joy is that we do so knowing that the battle is already won, as Our Lord has promised. But Satan can even use this knowledge against us if we are tempted toward indifference. We must be ever vigilant -- after all, we are the Church Militant, not the Church Passive. Real love involves real hatred: whoever has lost the power of moral indignation and the urge to drive the buyers and sellers from the temples has also lost a living, fervent love of Truth. Charity, then, is not a mild philosophy of "live and let live"; it is not a species of sloppy sentiment. Charity is the infusion of the Spirit of God, which makes us love the beautiful and hate the morally ugly. It appears that I have already run out of semi-original ideas, so let's move on to the first series of posts I contemplated when I came up with this project: reflections on Vatican II and its major documents. I have already set forth many of the reasons why Pope Benedict's impending resignation saddens me. In the context of this series, another reason I am sad that the pope is resigning is that he will be the last pontiff who actually participated in the Second Vatican Council -- assuming the next pope is 70 years old or younger, the oldest he could have been in 1965 when the Council concluded was 22. It makes me very hopeful for the future that Pope Benedict has devoted so much of his pontificate to educating us on what the Council did and did not do. I do think that there is more that needs to be said (hence my apprehensiveness about his resignation) -- unfortunately, the prevailing view in the secular sphere (and in many Catholic circles) is that the Council somehow did away with the previous 1,900 years of Church history in terms of theology, liturgy, and the like. Both the ultra-orthodox and the ultra-progressive camps see the Council as a complete break with the past -- the ultra-orthodox see it as the point at which the Church fell into heresy, while the ultra-progressive see it as a watershed moment in Church history when the Church finally emerged from all those hundreds of years of backward thinking. This is what Pope Benedict has called on many occasions the hermeneutic of rupture -- as opposed to the hermeneutic of continuity, which is how the Council should be viewed. The hermeneutic of continuity views the Council as completely in line with Catholic tradition, given the same weight as other Councils of the Church -- not as the start of Church history, as many of a liberal persuasion would believe. [T]here was the Council of the Fathers - the true Council - but there was also the Council of the media. It was almost a Council in and of itself, and the world perceived the Council through them, through the media. So the immediately efficiently Council that got thorough to the people, was that of the media, not that of the Fathers. And while the Council of the Fathers evolved within the faith, it was a Council of the faith that sought the intellectus, that sought to understand and try to understand the signs of God at that moment, that tried to meet the challenge of God in this time to find the words for today and tomorrow. So while the whole council - as I said - moved within the faith, as fides quaerens intellectum, the Council of journalists did not, naturally, take place within the world of faith but within the categories of the media of today, that is outside of the faith, with different hermeneutics. It was a hermeneutic of politics. The media saw the Council as a political struggle, a struggle for power between different currents within the Church. It was obvious that the media would take the side of whatever faction best suited their world. There were those who sought a decentralization of the Church, power for the bishops and then, through the Word for the "people of God", the power of the people, the laity. There was this triple issue: the power of the Pope, then transferred to the power of the bishops and then the power of all ... popular sovereignty. Naturally they saw this as the part to be approved, to promulgate, to help. This was the case for the liturgy: there was no interest in the liturgy as an act of faith, but as a something to be made understandable, similar to a community activity, something profane. And we know that there was a trend, which was also historically based, that said: "Sacredness is a pagan thing, possibly even from the Old Testament. In the New Testament the only important thing is that Christ died outside: that is, outside the gates, that is, in the secular world". Sacredness ended up as profanity even in worship: worship is not worship but an act that brings people together, communal participation and thus participation as activity. And these translations, trivializing the idea of ​​the Council, were virulent in the practice of implementing the liturgical reform, born in a vision of the Council outside of its own key vision of faith. And it was so, also in the matter of Scripture: Scripture is a book, historical, to treat historically and nothing else, and so on. And we know that this Council of the media was accessible to all. So, dominant, more efficient, this Council created many calamities, so many problems, so much misery, in reality: seminaries closed, convents closed liturgy trivialized ... and the true Council has struggled to materialize, to be realized: the virtual Council was stronger than the real Council. But the real strength of the Council was present and slowly it has emerged and is becoming the real power which is also true reform, true renewal of the Church. It seems to me that 50 years after the Council, we see how this Virtual Council is breaking down, getting lost and the true Council is emerging with all its spiritual strength. And it is our task, in this Year of Faith, starting from this Year of Faith, to work so that the true Council with the power of the Holy Spirit is realized and Church is really renewed. We hope that the Lord will help us. I, retired in prayer, will always be with you, and together we will move ahead with the Lord in certainty. The Lord is victorious. Thank you. His closing hits the nail on the head -- it has taken some time, but the true Spirit of the Council is finally coming to the forefront as more people are actually reading the documents and reflecting on them in light of authentic Catholic tradition. It turns out that the Council documents don't actually call for hideously ugly churches, ripping out altar rails, the abandonment of sacred music, or lay participation in Holy Mass taken to the extreme -- who'd have thunk!? With these issues in mind, I begin this series on Vatican II. My first stop will be Sacrosanctum Concilium (unsurprising for those who know my affinity for liturgical matters...). The number of posts I devote to each of the four major constitutions will depend on how quickly I read them and how many points I find striking in each document. I can warn you already, there will be quite a few on Sacrosanctum Concilium :-). I also may intersperse other posts among this series. My goal in this series is to offer my reflections, such as they are, on the documents and highlight what the texts actually say as opposed to what people want them to say or what the oft-touted "Spirit of Vatican II" says (hint: it's almost never what the Council actually said). Off we go! I started this blog way back in April 2008 primarily to express my excitement over Pope Benedict's visit to the United States. As my free time and enthusiasm faded, so did the frequency of my posts -- to the point where I only posted once every couple of years. Given that this is a resurrection (of sorts) of this blog, I thought it might be nice to engage in some reflection on the origin of the title I chose way back in the day. So, for the first day of my Lenten blogging project that isn't Ash Wednesday or Valentine's Day, I give you a reflection on the title of this blog. Then I saw a new heaven, and a new earth. The old heaven, the old earth had vanished, and there was no more sea. And I, John, saw in my vision that holy city which is the new Jerusalem, being sent down by God from heaven, all clothed in readiness, like a bride who has adorned herself to meet her husband. I heard, too, a voice which cried aloud from the throne, Here is God’s tabernacle pitched among men; he will dwell with them, and they will be his own people, and he will be among them, their own God. He will wipe away every tear from their eyes, and there will be no more death, or mourning, or cries of distress, no more sorrow; those old things have passed away. And he who sat on the throne said, Behold, I make all things new. (These words I was bidden write down, words most sure and true.) And he said to me, It is over. I am Alpha, I am Omega, the beginning of all things and their end; those who are thirsty shall drink—it is my free gift—out of the spring whose water is life. Who wins the victory? He shall have his share in this; I will be his God, and he shall be my son. Personally, I don't think there is a more beautiful scene in all of Holy Scripture than this one. Though I had been familiar with this passage for some time prior, it was made especially poignant for me by two experiences I had during college. The first was when I saw The Passion of the Christ -- in the scene where Jesus is on the way to Golgotha, He falls in front of his Blessed Mother. While He is on the ground, crushed beneath the weight of the Holy Cross, He looks up at her and says: "See, mother, I make all things new." Unfortunately, I can't find a clip of this scene that hasn't been removed from YouTube due to copyright restrictions. I would not normally expect myself to be a fan of this kind of creative license taken with the Passion narrative, but this was an intensely powerful scene for me. This line can be interpreted on a number of levels, but the most emotional for me was the comfort Our Lord gave to His Blessed Mother in her sorrow. It was by His actions right there, more than at any other time, that He truly did make all things new by sanctifying the world with his blessed Passion and precious death and opening the way for us to attain that "new heaven" seen by St. John. It may be a bit selfish, but one of the main reasons I love this piece of music is that the tenor line contains the most beautiful line in the piece (starting around 2:45) -- "And God shall wipe away all tears from their eyes." This is not necessarily a blog about renewal per se, but the kind of renewal brought about by Our Lord's suffering, death, and ultimate triumph over the grave is of utmost importance to the Christian life. In writing on issues relevant to the Church in the modern world, I hope to highlight areas where Our Lord continues to make all things new. She is a fantastic mother. In a very short time, she has become quite adept at handling four young children at once, while still managing to find time to get dinner on the table and clothes washed. She finds time for the big kids in between the twins' nursing sessions. I don't think there has been a single day since the twins were born that I have come home to anyone screaming (with the possible exception of John Paul, being a ridiculous three-year-old). Need I say more? She loves me in spite of my many faults. I am not always the easiest person to live with (I know, you're shocked to hear this) for any number of reasons, but she puts up with it and loves me anyway. She loves her Faith. In fact, she loves it so much that she started me down the path toward the Church some ten and a half years ago. Now, she loves it so much that our kids are well on their way to religious life. She is amazing at her "other" job. Seriously, I can't even imagine dealing with dozens of middle school girls on a daily basis, but she does so with ease -- and gets them to sing well, to boot. All while swearing she enjoys it! Even after all these years, I still want to be around her -- I guess that means she's a keeper :-). Happy Valentine's Day, Rosie -- I love you so much! I picked up a book of sermons by Bl. John Henry Newman tonight and flipped to one entitled Christian Repentance, which I figured would be appropriate for an Ash Wednesday meditation. Newman begins right off the bat with a very Catholic view of repentance (he was Anglican at the time): repentance as a continual process, not a fixed point in a man's life where he turns and begins to seek God. "We are ever sinning, we must ever be renewing our sorrow and our purpose of obedience, repeating our confessions and our prayers for pardon." This continual repentance is full and complete each time we ask for pardon -- this is why, even though we may confess the same sins over and over, we should not become discouraged, for we are always starting down the road to repentance and being continually converted with each confession of sins. Without knowing what will become of him, whether God will spare or not, merely with so much hope in his heart as not utterly to despair of pardon, still not looking merely to pardon as an end, but rather looking to the claims of the Benefactor whom he has offended, and smitten with shame, and the sense of his ingratitude, he must surrender himself to his lawful Sovereign. In this, Jesus shows us what offerings are necessary in the New Covenant: our very selves. And of course, in addition to these words, He lived this total self-sacrifice by offering himself as the perfect sacrifice for the expiation of our sins. Total surrender of self really is the crux of the matter, and something that I pray for when I am feeling especially penitent: complete abandonment of myself, offering all that I am to God so that He may break me down and mold me into something better than I am. Pope Benedict touched on this complete surrender of self in his homily today. When reflecting on the words of the prophet Joel calling Israel to return to God "with all your heart", he notes that this "means from the very core of our thoughts and feelings, from the roots of our decisions, choices and actions, with a gesture of total and radical freedom." And of course, despite the prodigal son's uncertainty as to whether his father would accept him back, we rejoice in the knowledge that our all-powerful, all-loving God will accept us back no matter what we have done as long as our contrition is sincere. Rather than viewing this unconditional love as a license to do whatever we wish, knowing that God will forgive us, we should strive to be perfect, as our Heavenly Father is perfect, and continue down the lifelong road of repentance. If you know me at all, you will know that my Lents usually involve cutting down my internet usage to a bare minimum (which, due to work, is usually higher than I would like). This year, I will still be doing some of that (no Facebook, etc. ), but in its place, I will be trying something different: I will endeavor to post something in this blog every day. I have come to the realization that I am good at giving things up for Lent, but not so great at undertaking new things (e.g., my attempt to read the entire Catechism last year failed miserably after about four days). I am not under any illusions here -- I recognize that almost no one knows that this blog exists, and my intention is not to garner a larger audience for myself (though I certainly welcome civil discussion from anyone who happens to read these posts). Instead, my goal is to force myself to do more spiritual reading and meditation and let this blog be a vehicle for further reflection. A series of posts on the sacraments (right now, one post per sacrament for a week, but that could change). In light of the Year of Faith in which we find ourselves, a series of posts on Vatican II as I attempt to make my way through the major documents produced by the Council Fathers. Reflections on the mysteries of Holy Week (getting a little ahead of myself, but the one for Holy Saturday will be awesome). I am also open to suggestions, of course. With that, off we go! For weeks now, I have been planning a resurrection (of sorts) for this blog during Lent this year. I had (and still have, I suppose) grandiose plans of posting every day during Lent about something related to Catholic news, my own Lenten reading, and the like. I was planning to make my bold foray back into the blogging world with an introductory post on Shrove Tuesday (tomorrow). And then this morning's news hit. So, here is a precursor to my Lenten blogging. Following my initial period of disbelief (which lasted for the better part of the morning), I have been alternating about every half hour between being on the brink of tears and being supremely confident in the Divine Will. 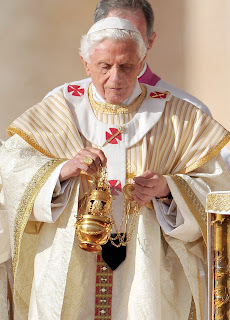 Not that there are "camps" or "teams" for our past two pontiffs, but in theological and liturgical matters, I am most assuredly a child of Benedict XVI. I think that he has been a tremendous gift to the Church in so many ways -- his clear love for tradition (in all senses of the word), his loving ecumenical heart that burns to see all Christians reconciled with the Church, his leading by example in liturgical matters (which are nearest and dearest to my heart and probably will form the basis for a future post or three). I know most people my age have a strong love for John Paul II because of when they grew up, but as a 2003 convert, I only knew the very end of his pontificate. Almost eight of my almost ten years in the Church have been under Benedict, and he has influenced my own faith journey in so many ways. He is my one and only Papa. The pure self-sacrificing love that shows through in everything he does, that beaming smile that shows the face of Christ Himself -- I love this man so much that I cannot express it in words. This is the closest I will get to any sort of speculation in this post, but I can't help but wonder if something is seriously wrong with his health. He didn't even wait until after Easter to announce this and he only gave two and a half weeks' notice beforehand. If indeed it is the case that his health is seriously deteriorating, this is the thing that makes me the saddest. After so much speculation that Benedict would only reign as pope for a short time and that he would not really have an impact on the Church (as a sort of "transitional" pope), he gave us almost eight years of theological brilliance and clear teaching on what it means to be authentically Catholic in the modern world. He started the Church on the path to true liturgical renewal -- a renewal based on continuity with tradition, not a break with the past. As the climax of his years of teaching on the Second Vatican Council, he began the Year of Faith in which we currently find ourselves. He has made it abundantly clear that the true meaning of the Council is not to be found in the "Spirit of Vatican II" but in the documents promulgated by the Council. He has named more than half of the Cardinals of voting age who will meet very soon to elect his successor. I think, by the working of the Holy Spirit, that we will be in excellent hands. Much as it feels like we are losing our Papa, he doesn't appear to be on death's door. I pray that Josef Ratzinger will have many more years of serving the Church in his own way. The comment I have seen most often today is that Benedict's resignation demonstrates his deep humility. To quote one of my favorite bloggers, "he leaves as he came, with a humility that shocks the world." And that's really what our Christian life is all about, isn't it? I hope that we will all learn from this great man how to do justice, love goodness, and walk humbly with our God -- and trust in our Lord Jesus that the gates of hell shall never prevail against our Mother Church.